This event offers 9.25 CE credits to attendees. CE accredited by The Western Multi-State Division is accredited as a provider of continuing nursing education by the American Nurses Credentialing Center Commission on Accreditation.. 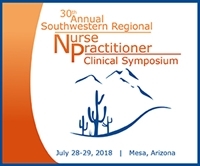 The 30th Annual Southwestern Regional Nurse Practitioner Symposium is a two day intensive program offering education to review and update current concepts in clinical and practice management for advanced practice nurses and advanced practice nursing students. AzNA & AZNPC are pleased to offer up to 9.25 hours of Content/CNE hours. Unless otherwise noted, all sessions offer Pharmacy contact hours for part or all of the presentation.